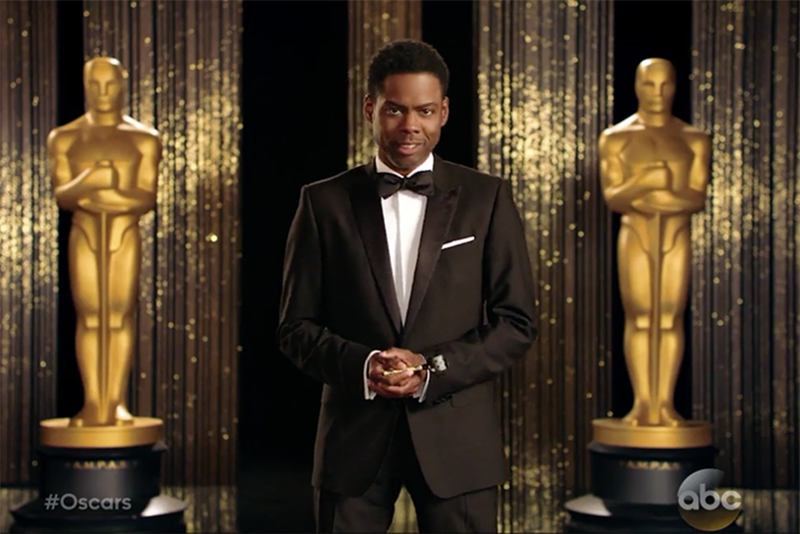 Chris Rock called the Oscars "the white BET Awards." Last Sunday night, Sam Smith won an Academy Award for Best Original Song. Eight months earlier, to the day, he took home a different award for his vocal stylings. On June 28, 2015, Smith won Best New Artist at the BET Awards. He was not at the show to pick up his trophy because, as co-host Anthony Anderson noted, "He’s white and didn’t think he would win at the BET Awards, and didn’t think he could win, but we showed him we love him, too." Smith was one of four white nominees that night. Come on, people. It’s got "black" in the name and it was still more inclusive than this year’s 88th Annual Academy Awards. Yes, Chris Rock was the host. Yes, a few black actors and actresses read the nominees. Sure, a black model handed the statuette to a presenter who then handed the statuette to a winner. On the bright side of the lack of diversity, only two black people showed up in the In Memoriam montage of the program. But alas, as was in 2015, there were no nominations for a black, Latino, Asian or Native American actor, writer or director. Before you ask, I did not boycott the Oscars. I wish I had; it was a bit of a yawn. But I was wide awake during the first few minutes, waiting to see where host Chris Rock was going to take things. And as expected, he went there. Rock came out like Adonis Creed, throwing jabs at everyone from the Academy, to Mr. and Mrs. Smith, to the ever-unconscious Stacey Dash. He made me laugh. Not as much as Louis C.K. or the duo of Ryan Gosling and Russell Crowe did — chalk another win up for the white guys — but I laughed. And while I expected to hear people try and fail to retell Chris’s jokes the next day, I was worried that the most important thing the "Pootie Tang" co-star said was buried between jokes: "We want opportunities. We want black actors to get the same opportunities. That’s it." Yep, that’s it. Not handouts. Not tokens or resigned inclusion. Opportunities. There are some not-so-surprising comparisons to be drawn between the current state of Hollywood and Madison Avenue. Case in point: At a much smaller event that will take place in just a few months, the Advertising Hall of Fame induction ceremony, there are no people of color receiving the "most prestigious award bestowed in the advertising industry honoring individuals who have raised the standard for advertising excellence." Admittedly, this is an unfair comparison, since there are a limited number of people in the ad industry eligible for this award; there are only a handful of people nominated each year; and, unlike the Oscars, there were people of color inducted last year. But the root of the long-term problem lies in facts like this: According to the US Bureau of Labor Statistics, since 2013, African-Americans are the only minority group to have seen a decrease in representation over the past four years and currently represent less than 6% of the advertising industry. The numbers for Asians and Latinos are growing, but at a very slow pace. If you follow the numbers to their logical conclusion, it is becoming less likely that someone of color will have the opportunity to be nominated for any advertising hall of fame, of any kind, anytime soon. Like Hollywood, one obvious source of the problem in the ad business is that the people who make the decisions to "green-light" often hire those who look like they do—white and male. In Hollywood, producers and writers decide not just the content, but what content is developed and who’s cast. Ninety-eight percent of Hollywood’s producers and writers are … wait for it … white. This year, the Academy of Motion Picture Arts and Sciences took a dramatic step to change the state of their industry. The president of the Academy, Cheryl Boone Isaacs, launched a five-year plan that "aims to promote more diversity of age, gender, race, national origin, and point-of-view in Hollywood." What makes this initiative different from what other organizations are vowing to do to create opportunities for people of color? It acknowledges that the problem lies within and that for the situation to change, the institution must change. So they’re changing. They’re changing the diversity of their own staff and governance. They’ve invited its most diverse group ever of new members. They’ve revoked voting privileges from members who are no longer "active." They’ve created new seats on its board of governors and committees for women and people of color. They are also pushing for changes at the front end of the process, including encouraging productions to not just find but hire more diverse crews. The ad industry has been preaching and promoting change for years. They could take a page out of the Academy’s plan to get it right by making big, sweeping and meaningful changes at the highest level all with the goal of providing opportunity. "We want opportunities. We want black actors [ad people, marketers, coaches, police officers] to get the same opportunities. That’s it." I’m not expecting, nor do I want, next year to be the black Academy Awards. And the goal isn’t to change Madison Avenue to MLK Boulevard — although more than a few agencies could use some uptown flavor. But given the current trends, we are more likely to see an industry that looks a lot like the last two Oscars than not. And, as the title of Sam Smith’s award-winning song so aptly notes, if those who have the power to make sweeping changes in the ad industry don’t use that power, the writing’s on the wall. Danny Robinson is SVP/group creative director at The Martin Agency in Richmond, Va.